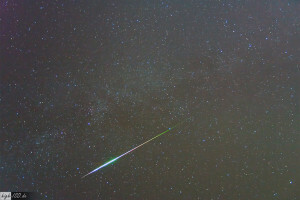 The Delta Aquarid meteor shower peaks this year around July 28. This annual event favors observers in the southern hemisphere and southerly latitudes in the northern hemisphere, though all observers can see some of these slow-moving meteors. The meteors of the Delta Aquariids appear to radiate from a point near the star Skat (δ Aquarii) in the constellation Aquarius. The shower peaks around July 27-30, but unlike most meteor showers, the Delta Aquarids lack a sharp peak so meteors are visible from mid-July through early August. The maximum hourly rate can reach 15-20 meteors in a dark sky. Because of their angle of entry into the atmosphere, the Delta Aquariids tend to leave long lingering trails which sets them apart from most other meteors. It’s still a bit of a mystery as to what causes the Delta Aquariids. Some astronomers suspect the event happens when the Earth passes through a stream of debris left by the periodic Comet 96/P Macholtz. The comet was only discovered in 1986, though the meteor shower has been observed since at least the 1870s. In late July 2015, near the time of the shower’s peak, a waxing gibbous moon will be out until after midnight. So the skies will be darkest and most favorable for seeing meteors a few hours before dawn as the shower peaks on July 27-30.